Thank you for a clear-eyed tally sheet of the consequences of one of the greatest cases of complacency and mismanagement in U.S. history. You should have included Google and Yahoo, since the value of these once prosperous newspaper stocks has effectively been transferred to these new companies. Not since IBM gave away software rights to Microsoft has a corporate pocket been picked so efficiently. I still cannot believe that newspaper companies spent all that money to have reporters collect information that corporate executives then just gave away for free. Yahoo today is worth $29.6 billion, and Google is worth $162.1 billion. "I still cannot believe that newspaper companies spent all that money to have reporters collect information that corporate executives then just gave away for free." I can. Today's newspaper execs could well be the worst business people in the history of the modern world. Textbooks someday will give them the skewering they deserve. Their solution to every problem is to redesign or to have some weak-link-of-humanity nutcake like Sam Zell or Dean Singleton blame the employees. "Not since IBM gave away software rights to Microsoft has a corporate pocket been picked so efficiently." IBM Executive: The profits are in the computers themselves, not this software stuff. I can only imagine the newspaper exec equivalent: The profits are in our masthead and our bloated salaries, not in this writing and information stuff. Let's redesign! No, consultants and the American Press Institute call it "content" today, and writers are "content providers. I seem to recall a fairy tale about a goose and an egg....it's funny how there are some basic truths in those children stories that today's captains of industry and their Wharton MBA advisers have long forgotten. I spent almost six years at a newspaper company, banging my head against a wall and trying to ignite the innovation fire. I say good riddance. The fundamental issue is and was distribution power. Newspapers no longer provide a reason to congregate to a point in the off-line or on-line world. So why should readers or advertisers care. Instead of focusing on building a reason to congregate - like Facebook, Flickr, YouTube or Google - newspapers focused on adding video and worrying about Google using its news stories. Gag! Complacency and mismanagement? In commercial terms, perhaps. Google and Yahoo are monstrously profitable, but they will never break a story, or hold anyone to account. They will never spawn the next Woodward or Bernstein. They satisfy the demand for instant gratification, and no more. Back in the day, newspapers like the Washington Post, the (London) Sunday Times, and many others, managed to couple access to an advertising market with a relatively noble ideal of shining a light on authority. In the long term they earnt their readers' trust, and thereby maintained their advertising market. The internet has devastated that coupling. Any website can pay its way with Google ads. Every website needs as many hits as it can get, every day. Loyalty has been destroyed. How, in that climate, can any news organisation justify expenditure on proper, digging journalism? Do you have comparable numbers for Media News Group? And why is WPO holding value compared to the other corporations? The answer is greed, overarching greed. Owners demand and get 30 percent margin. The average for US companies is 7 percent. Even as they twist in the wind, many chains continue to loot 20 to 30 percent. This has been going on for decades, since offset and computers eliminated the old backshops. I was in the business for 50 years and watched the debacle from the inside. 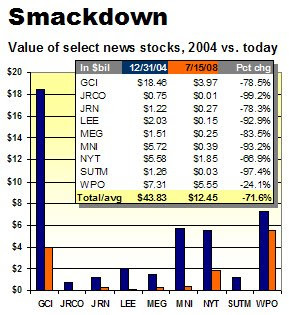 Instead of reinvesting in decent salaries, larger news staffs, the companies pocketed their ill -advised gains. Good riddance. I think the Washington Post has done better than most publishers because they diversified into some education publishing that has done much better than newspapers. The difference between all of these entities and IBM, however, is that IBM, having made the mistake and faltered, changed its management, ventured into new services businesses, bought software companies, sold off businesses that didn't work, and restructured its workforce globally when necessary (almost overnight India was its second largest employee population). Today it blew away earnings estimates in a difficult environment and every year leads the world in patents obtained. In other words, it changed. It may even outlast Microsoft, which is now fighting open source at every turn (IBM has embraced it). Compare that to the media - no ability or willingness to make hard decisions and adapt, and so one-sided generally that it alienates at least a third of its potential readers. There's no "IBMosauraus" blog. , and writers are "content providers. Writers are not the Golden Goose my friend. Distribution of content is and without that writers will be writing on the walls of caves again. Your part of the problem not the solution. Anything you create can be found in 1000 other locations. Writers only have value in two newspaper towns with dial up internet access. Its true....I made millions of dollars behaving counter to your idea's. And I"m still building my castle while you weep. At today’s close, the total decline in value of the dozen newspaper shares trading since the first of the year was nearly $27.7 billion, a plunge of 35.7% in 6½ months.